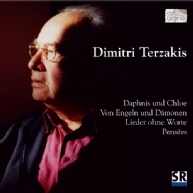 Although listening to the music of Dimitri Terzakis must be among the most enjoyable and fruitful experiences in life, surprisingly little is actually happening, at least on the surface. For instance, all Terzakis needs to create the impression of heft and density in his piece Von Engeln und Dämonen is a solo viola. Contrasts between micro-intervals and harsh double-stop passages, on the one hand, and dance-like figures and lyrical moments, on the other hand, are employed to greatest effect. Of course, mere sound effects are never his real concern – even though his Lieder ohne Worte for solo voice appear to have been designed to work entirely without “content”. In his piano cycle Pensées, Terzakis seeks to capture the essence of the Mediterranean frame of mind “without the use of the versatile quarter note or the micro-intervals of the enharmonic tetrachord.” (Christoph Sramel) In his Daphnis und Chloe, Terzakis set to music key passages from the ancient Greek story by Longos. The piece covers a broad emotional scale ranging from the tender awakening of love to the satisfaction of supreme ecstasy. There is little doubt that the unique beauty and the great originality of Terzaki’s compositional work are, in part, due to influences from ancient Greek theories about music. The truth is out: Haydn was a jazz composer! Franz Koglmann took the diligent classic’s 27th symphony with him on his Nocturnal Walks. “The Raft of Piano Keys”: Hans Werner Henze’s complete works for piano, between Mediterranean impromptus and the search for lost time. Orte und Zeiten/Tempi e Luoghi is the musical version of an Italian journey, an encounter with the entwined histories of Germany and Italy.